FORT LEE, Va. (April 18, 2013) -- The chief executive officer of the Army and Air Force Exchange Service visited Fort Lee April 8 to learn more about the store operations here. 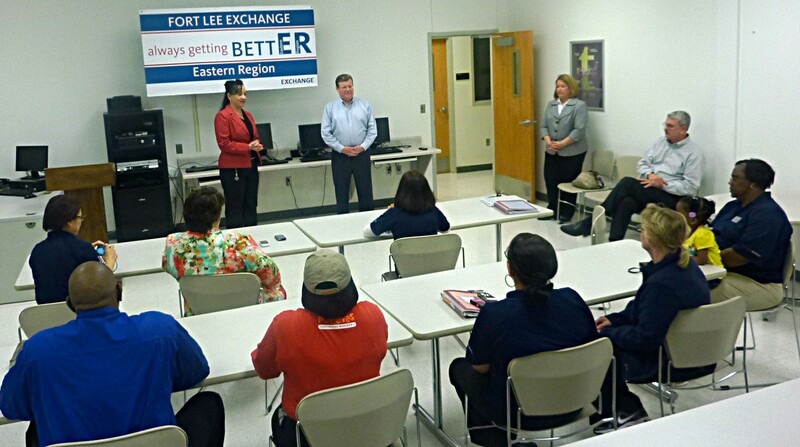 Thomas C. Shull spent time with Fort Lee command representatives and exchange employees during his first-time trip to the installation. He is the first civilian to be named to AAFES' top post. He is a U.S. Military Academy graduate and served as a major in the Army. He earned a master of business administration with honors from Harvard Business School in 1981. His military schooling includes Ranger and Airborne training. Since Shull was named to the CEO position last year, he has been working to improve various Exchange offerings, including changes to the online system. 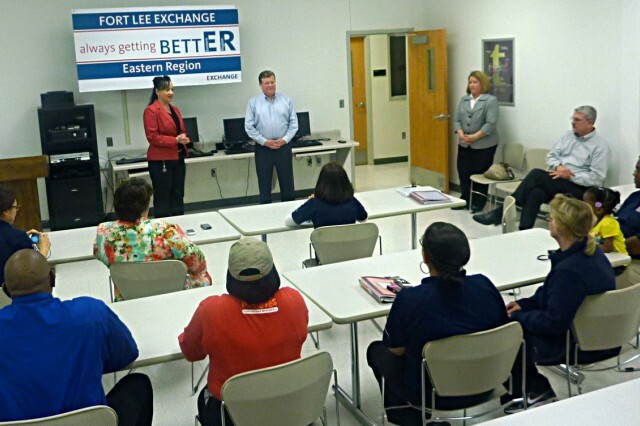 "We're focused on ensuring key items offered in the Fort Lee Exchange are online at shopmyexchange.com," Shull said. "All initiatives are designed to ultimately expand the Exchange's reach and service to the military community and their families. I am using my experience to make it easier for authorized shoppers to access our website privileges, find better value and generate increased customer satisfaction." The Exchange's first priority is to take care of military members and their families, said Shull. "The customer and customer service is our number one priority," he said. "We are focused on the lifelong needs of shoppers starting with the war-fighter, his or her family, and working all the way up to the retiree. Offering comprehensive support through all stages of a military career is the foundation to maintaining the relevance of the Exchange benefit. "Regardless of their geographic location, Exchange operations adapt to changing needs of service members," he said. "For example, a snack and a cold drink may make the Exchange relevant downrange. Closer to home, operations must be able to assist in furnishing a residence, assist in providing Internet, phone or television services or offer clothing for a job interview after their military career is complete. From a retail standpoint, we need to have what they need when they need it." Since the Exchange is a retail entity, it pays its own way and then some, said Shull. The vast majority of the funding -- 98 percent -- comes from the stores themselves, and is not subsidized by taxpayers. The organization generates earnings and distributes a majority of its dividends to military morale, welfare and recreation programs. In fiscal 2011, from the money spent at Exchange facilities on Fort Lee, the operation returned $1,378,126 to the community in support of Family and MWR services and activities. "We are passionate about serving every member of the military family and saving the American taxpayer money," Shull said. "Between distributing the dividend to the services, providing school lunches overseas, operating bakeries and water plants outside of the Continental U.S., investing in capital improvement on military installations, and operating contingency facilities and contingency telecommunication operations, the Exchange saves the federal government $1.3 billion every year. "It's not just a great deal for Uncle Sam, but shoppers as well," Shull continued. "The Exchange is a benefit that increases the combat potential of America's forces and enhances the probability of successful mission accomplishment. Wherever troops are, an Exchange is there to support them. Our operations are destinations of choice for Soldiers and their families to improve readiness and make their lives better." With many installations seeing decreased operations due to the furlough, Shull said AAFES should continue to serve as normal. "The bottom line for shoppers is that the Exchange does not foresee any changes to its day-to-day operations," he said. "We continue to remain flexible as we help Soldiers and their families thrive in this environment. Whether it's a Main Store, Military Clothing or a fastfood restaurant, all operations will continue." As for upcoming changes to the Fort Lee Exchange, Shull said the store is in the design phase for a Starbucks, which is expected to open in March or April 2014. Implementing the concessions that people want is all part of the how the Exchange serves its customers. "We will also continue to look for the most meaningful concepts and grow concessions to support active-duty shoppers," Shull said. "We will even offer more convenience with more Express businesses. The Exchange has done a fantastic job in those businesses but they need to be given an increased focus."